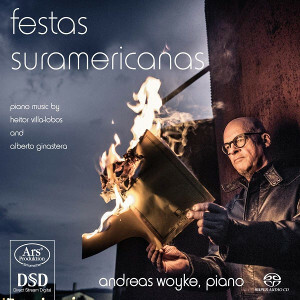 Under the somewhat prosaic Hispano-Portuguese composite title ‘Festas Suramericanas’ Andreas Woyke delivers samples of little known or hardly recorded South-American piano music, interpreted with such committed passion and affection that it must be a top choice amongst the few existing recordings. This German pianist was and still is a long time trusted and most supportive companion of the Austrian cellist, Friedrich Kleinhapl. They have been touring together successfully in numerous countries and several of their releases (all of them on the ARS label) met with accolades here (Beethoven: Cello Sonatas 1-3 - Kleinhapl, Woyke and elsewhere. Mostly core European repertoire. However, at closer scrutiny it becomes clear that Woyke is not only a first rate pianist in his own right, but also takes pride in creating much more varied activities: Jazz à la Friedrich Gulda and Chick Corea, improvising like Keith Jarrett (Braiding Bach & Chopin, both released in Hi-Res) and giving master classes and teaching at the University of Music and Performing Arts, at Graz, Austria. With this third solo album for ARS Produktion Andreas Woyke proves what an all-round artist he really is, spanning his imaginative and cultured wings even wider across the South Atlantic Ocean to Latin America. Not surprisingly knowing that one of his very first teacher was the Argentine pianist Aldo Agnotazzi. Moreover, his regular concert visits to Latin Amerika must have further developed his love for and his understanding of South American music and composers like Heitor Villa-Lobos and Alberto Ginastera in particular. Although Villa-Lobos has undergone European influences (Bach), both recorded pieces require a pianist who can convincingly convey a diversity of typical Brazilian folk rhythms and passionate moods with technical flair and, indeed, Latin fire. Had I not read the booklet, nor seen the cover, I would have been persuaded that I was dealing with the virtuosity of a Nelson Freire in the Rudepoêma, one of the more (or most) complex piano compositions of the first half of the twentieth century, or (the elder generation may still remember) the magic agility of a Guiomar Novaes in the Cicle Brasiliera, a Journey into the Traditions of the Brazilian North-East. Woyke’s intensely committed playing was for me a total ‘ear’ opener. As for the other two works on this disc, it may be clear that Argentina is not Brazil, nor does Ginastera resemble Villa-Lobos. But showing once again his immense understanding of regional differences, Woyke gives the three Danzas Argentinas its typical and undeniable local flavor, combining phenomenal technique with sensual and velvety mellowness in the second and rhythmical sarcasm in the third dance. Beautifully shaped though these dances are, and however interesting to have them here on record, the main item is of course Ginatera’s Sonata No. 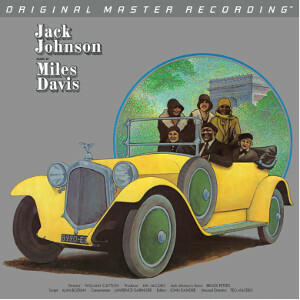 1 Opus 22. 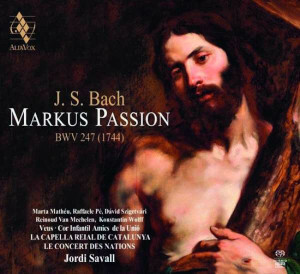 It has its devotees amongst a small number of pianists, but it surely deserves wider recognition. Competition, if any, would, in my view, come from François‐Xavier Poizat (Piano Classics label). However, on balance I can hardly think of someone who can do it better than Andreas Woyke, with on top of that having the advantage of the (far) better sound reproduction in high resolution and last but not least the glowing warm timbre of the Bösendorfer grand used in this recording. 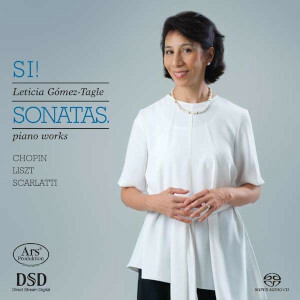 A strong recommendation (also in stereo) for lovers of Latin American piano music as well as for all those wanting to know more about these composers. Well done!